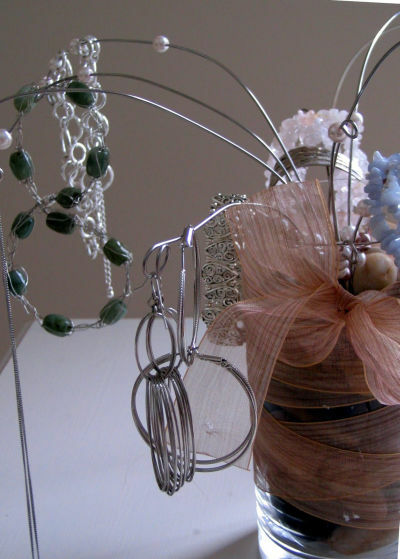 I’m thinking of making one of these as a display piece for craft shows; I make a lot of hook-style earrings and this is the perfect way to show them off while taking up minimal table space. Rather than spend money on decorative stones, I plan to use beach glass that I have collected along the Lake Michigan shoreline. You can also go hunting for pretty rocks almost anywhere! That is absolutely fabulous. I’m definitely stealing this idea! Copied this! It’s taken pride of place in my bedroom. p.s I now need to buy a new whisk! Wow, how original! I love your site and check it every single day! Stop by and visit me sometime over at Free 2 Be Frugal. That is awesome! I keep my often-worn earrings on a little tree thingy and it’s really helpful! Also I know I have a safe place to put my engagement ring when I need to take it off.